Insurance coverage for low-dose CT (LDCT) lung cancer screening has opened the gates, but how many patients will actually pour into imaging facilities remains to be seen. Most imaging professionals agree that the 7 to 10 million people who are now covered for screening will not come forward all at once. They will show up in much, much smaller quantities and growth will be gradual, according to Ella A. Kazerooni, MD, MS, and Geoffrey Rubin, MD, FACR. "I don't expect 7 to 10 million people are going to come forward over the next few years," says Kazerooni, a professor, associate chair for clinical affairs, and director of cardiothoracic radiology at the University of Michigan; American Board of Radiology trustee; and chair of the ACR Committee on Lung Cancer Screening. "I think there is going to be a slow increase in volume." "I'm expecting a gradual increase," says Rubin, a professor of radiology and bioengineering at Duke University School of Medicine and a scheduled moderator for sessions on LDCT at the ACR's May annual meeting. The initial numbers will be low for several reasons, including patient access. "There are multiple factors that affect access to screening," Rubin says. "There is the issue of matching the facility and its capabilities with the location of the screening population. That is difficult because the top institutions tend to be in larger cities and, while there is a substantial number of smokers in large cities, there are more in rural areas. It's going to be a matter of getting the services out to where the people are located." Another complication, Rubin adds, relates to the fact that a greater percentage of people who smoke has lower incomes. People with higher incomes tend to smoke less. "Smoking is leaving these fancy places, these big urban areas," Ali H. Mokdad, PhD, a researcher at the Institute for Health Metrics and Evaluation, told The New York Times. "But it has remained in these poor and rural areas. They are getting left behind." Mokdad is coauthor of a recent analysis of federal smoking data published in Population Health Metrics in December 2014. Kazerooni adds that some smokers avoid screening because they feel responsible for a positive finding. "Breast cancer can be considered a no-fault disease. It is related to genetics primarily or people randomly have features of breast cancer," Kazerooni says. "With lung cancer, smoking is obviously the risk factor. It is responsible for at least 85% of all lung cancers. So, the 'I did it to myself' [perception] may exist." Kazerooni also believes smokers will avoid screening because they do not want to be told to stop smoking. Yet, what will motivate many eligible people to go forward with screening is the fact that they will not have to pay out of pocket for it. And, since the Centers for Medicare & Medicaid Services' (CMS) approval comes after the Affordable Care Act's (ACA) approval for the same, even more people will have screening coverage. The ACA requires all nongrandfathered private insurance plans to cover any service that is given a grade A or B as an effective prevention measure and includes such measures in its Essential Health Benefit. The US Preventive Services Task Force (USPSTF) gave lung cancer screening a "B" grade in December 2013. • be a person with a smoking history of at least 30 pack years who currently smokes or has quit within the last 15 years. The coverage required by the ACA stretches to age 80 across its board of coverage: those who are enrolled in state health marketplace plans and Medicaid-expansion programs and those with nongrandfathered private insurance plans who meet the screening criteria. CMS covers screening for those between the ages of 55 and 77 through traditional Medicare, specifically Medicare Part B, and Medicare Advantage, and for individuals 78 and older only through Medicare Advantage plans that opt to cover screening for that age group. The plans are outlined nicely in a chart available on the American Lung Association's website. ACA-required coverage started for those enrolled in state health marketplace plans and Medicaid-expansion programs January 1, while coverage for those with nongrandfathered private insurance plans will depend on the beginning of the plan years. Under the CMS' plan, patients eligible for screening coverage are to show "no signs or symptoms of lung cancer" and are required to attend counseling sessions. Medicare beneficiaries must receive a written order from a physician or qualified nonphysician practitioner who meets certain requirements. The coverage provided by all of these types of plans is sure to bring patients in for screening, says Larry Weber, MSRS, chief operating officer at Desert Radiologists in Las Vegas. "The US Preventive Task Force published its support for lung cancer screening in high-risk patients in early 2013; since that time, lung cancer screening programs have been at the expense of either at-risk patients or health care providers willing to provide the service at little or no reimbursement," he says. "Now that Medicare will be covering the service to these high-risk patients, the volume of services is definitely expected to increase." To help prepare for whatever volume of patients will come forward, screening centers should take the important first step of making sure radiologists and primary care physicians, who will both be involved in screening programs, "come up to speed" on specific issues surrounding lung cancer screening, Rubin says. While radiologists have always been involved in reading CT scans for lung cancer, most of their experience is with the scans of symptomatic patients. Screening growth will mean reading the scans of thousands of asymptomatic patients. "The performance of LDCT exams, the interpretation, and the reporting of results will be new areas for virtually all radiologists," Rubin says. To help radiologists with such issues, the ACR is putting together some educational programs for radiologists with the intent to have them completed by its May meeting, Rubin says. He also suggests radiologists get familiar with the ACR's newly published Lung Imaging Reporting and Data System standard, which provides a framework for reporting and managing findings on screening lung CTs. Under the CMS' coverage plan, radiologists are required to be board-certified by the American Board of Radiology or equivalent organization, to have active certifications, and to have performed and interpreted 300 chest CT scans in the previous three years. Because the patient population is predicted to increase over time, CT screening facilities have time to develop efficient workflows and protocols to provide quality care. Preparations should include scheduling times for radiologists and technologists to coordinate with technologists. Radiologists, Rubin notes, are responsible for seeing that scans meet requirements and must see that the correct protocols are followed, including making sure that the radiation doses are appropriate for the size of the patient. "Centers should set up systems to have regular meetings between radiologists and technologists to review cases that went well and those that were problematic to create an environment of continuous learning based upon early experience in order to improve even more with time," Rubin says. "Effective centers will have mechanisms in place to monitor the appropriateness of every patient's protocol." Kazerooni says the anticipated gradual increase in patient load does not necessarily warrant the immediate purchase of new CT scanners. At some point, CT facilities may need to adjust scheduling and staffing in order to manage a growing patient load. Kazerooni suggests making screening available on weekends and evenings, especially since this type of screening does not require intravenous contrast support staff. "I don't think we are going to have the sort of circumstance where all of a sudden there are going to have to be 1,000 new CT scanners having to be installed overnight to accommodate the volume," Kazerooni says. "I think it most likely will be a slow, gradual process." On the interpretation side, teleradiology use is expected to handle at least the initial expansion. 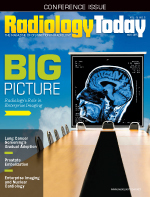 "Teleradiology programs can accommodate places where they don't have enough volume to add a new radiologist," Kazerooni says. Imaging facilities also will lean on EMR programs to fulfill a CMS requirement to submit clinical and follow-up data to an approved registry. Registries already are up and running and the ACR has applied to the CMS to serve as one. Registries help support quality standards, such as making sure that patients being screened are within the criteria, and that radiation doses are low and adjusted for patient size. "The EMR is a friend in reporting to registries," Kazerooni says. EMR systems also will allow facilities to efficiently track patients, which is key when a facility is managing subsequent screening exams and setting future growth goals. "Providers will be tracking the uptake of patients and the growth of programs and once they see the results, they will be able to better plan for how quickly to grow," Rubin notes. EMR systems can also play a key role in getting patients to screening since they can be set to deliver a "best practice alert" when a patient who meets the criteria presents in a clinic for an unrelated health issue. "That is a huge advantage that we did not have when mammography came out. Providers have a lot on their plates to think about, so having this kind of alert system through the EMR helps physicians and medical assistants know when to consider screening," Kazerooni says. Educational materials being developed by facilities will be distributed as part of the counseling sessions that are required by the CMS to explain the screening process, address fears and expectations, and discuss the potential for additional studies. "We are developing patient education resources to help people better understand the new screening guidelines and know what to anticipate during the test," says Andrea Clair, brand manager at Tristate Imaging, which includes more than 30 outpatient imaging centers in Pennsylvania, New Jersey, and Delaware. "Our materials will be printed and available for patients to bring home. We are also planning to do a tie-in to Lung Cancer Awareness Month in November." The ACR offers an accreditation program for screening facilities. The accreditation is not required under CMS rules, but it serves to represent a facility's dedication to quality. Patient education and quality services will hopefully convince eligible smokers to seek screening, but until the numbers start rising, many facilities are taking a wait-and-see approach. Denver's National Jewish Health, for example, plans to conduct a needs assessment before hiring additional staff members or purchasing new equipment, according to Debra Dyer, MD, FACR, chair of its department of radiology. "Imaging will purchase new or upgrade present equipment as necessary. If volume grows, we may need to buy the software for our other scanner," Dyer says. National Jewish Health says it plans to hire some staff outside of the radiology department, such as counselors and nurse practitioners, reflecting an anticipated area of growth. "We are planning to hire nurse practitioners/physician assistants to do shared decision-making sessions with patients and provide smoking cessation counseling. We are training current staff to become tobacco treatment specialists for face-to-face counseling," Dyer says. A team response such as that being established at National Jewish Health is imperative to meeting the growing needs of a lung cancer screening program, according to Rubin. "Screening sites will need to be prepared to coordinate a multidisciplinary effort that provides for outreach, counseling, and follow-up medical care for positive results," Rubin adds. Screening growth also will depend on related costs and reimbursement, both of which also need to be assessed over a period of time. "We are a little way off from knowing what the reimbursement is going to be for lung cancer screening CT," says Kazerooni, who hopes that reimbursement will be comparable to that for a noncontrast CT, or even more since the LDCT screening program will require the additional work associated with the requirement for reporting clinical quality registry. "We don't yet know the full spectrum of costs associated with conducting one of these programs," Rubin adds. At this point, many centers across the nation are most likely taking the same response as Vero Radiology Associates in Vero Beach, Florida. Although the facility anticipates more eligible patients coming in for LDCT screening, it does not feel an urgent need to make any adjustments in staff, scheduling, or equipment, according to Patient Services Coordinator Mindy Nunnelee. Vero Radiology hired a nurse navigator this past fall to teach smoking cessation and track patients. While a torrent of screening patients is not anticipated, imaging facilities should examine what it will take to add screening, as they would for any addition to their service line.